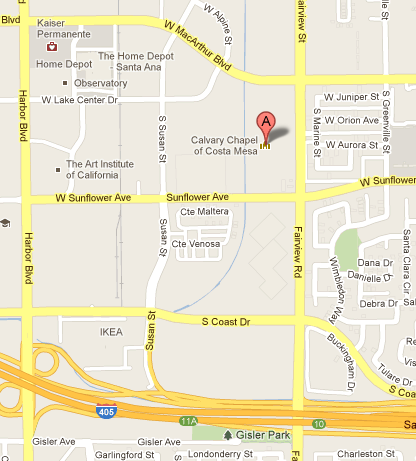 A BUBBLING CAULDRON: What's Happening In Costa Mesa? I'd intended to write this one earlier but the week just got away from me. 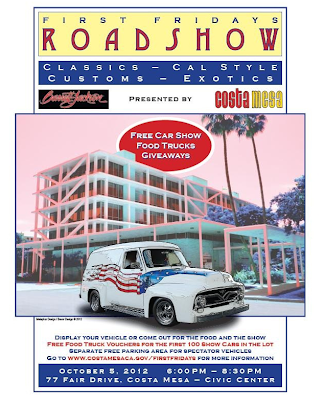 There are lots of interesting things happening in Costa Mesa over the next few days. Here's the schedule of a few. The Costa Mesa Chamber of Commerce honors the brave men and women of the Costa Mesa Police Department and the Costa Mesa Fire Department by hosting its annual Public Safety Appreciation BBQ at the Orange County Fair and Event Center from 11:00 a.m. - 1:00 p.m. Here's their flier. Click on the image to enlarge it. This is the most recent edition of this event, held on the first Friday of each month in the City Hall parking lot at 77 Fair Drive from 6:00 to 8:30 p.m. Here's their flier. Click to enlarge. 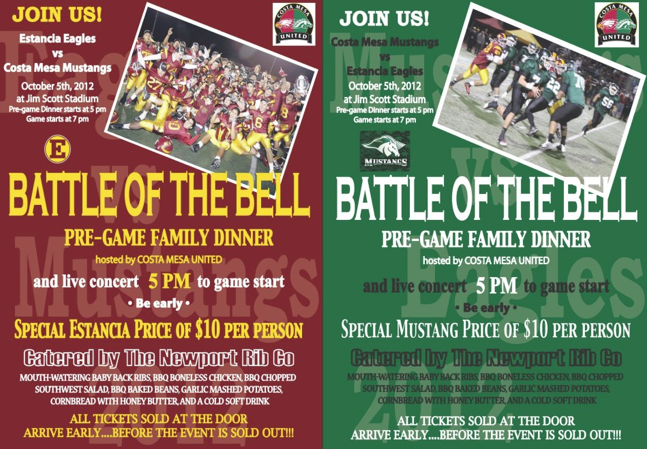 The Estancia High School Eagles take on the Costa Mesa High School Mustangs in this annual football rivalry. The game begins at 7:00 at Jim Scott Stadium at Estancia High School. 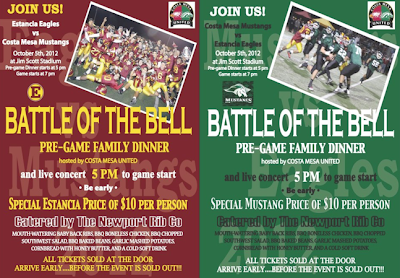 Prior to the game, at 5:00 p.m., Costa Mesa United is holding their pre-game family dinner, catered by the Newport Rib Company. Here's their flier. Click to enlarge. The Costa Mesa Fire Department is holding an open house at all six fire stations in the city from 11:00 a.m. - 1:00 p.m. Lots of interesting information will be available to promote family safety. Here's the locations of the fire stations. Click to enlarge. 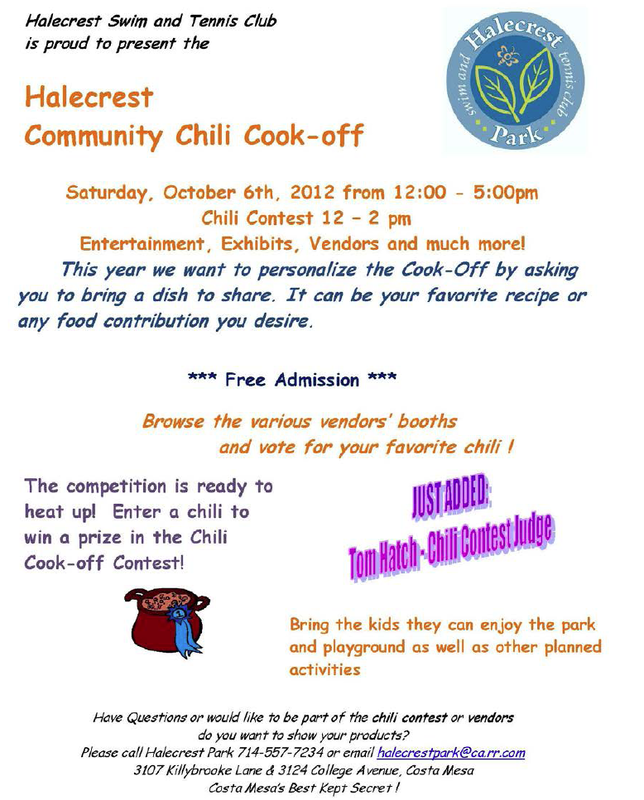 After visiting one of the fire houses, stop by the annual Halecrest/Hall of Fame community chili cook off at Halecrest Park from noon - 5:00 p.m. You're almost guaranteed to see some of our local politicians at this event and also have a chance to meet some of your neighbors and sample some GREAT chili. Here's their flier and map. Click to enlarge. 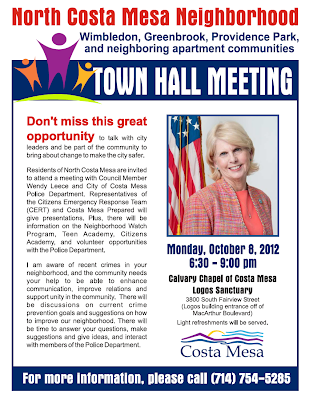 Councilwoman Wendy Leece will host another in her series of public safety town hall meetings. 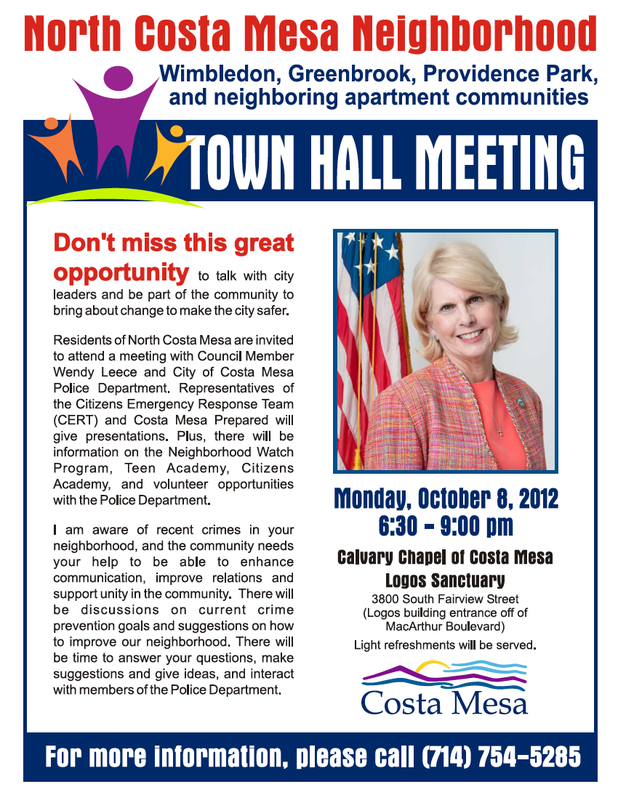 This one is designed to present information to our neighbors in the north part of town, but all are welcome. 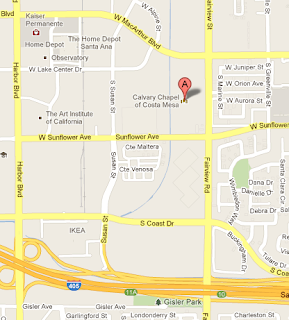 It will be held at the Logos Building at Calvary Chapel from 6:30 - 9:00 p.m. Here is their flier and map. Click to enlarge. Thanks for you and Mayor Bever - promoting the Friday Car Show at the City Hall. Looks like Mayor Bever is moving bact to his former eagle status - see you there. 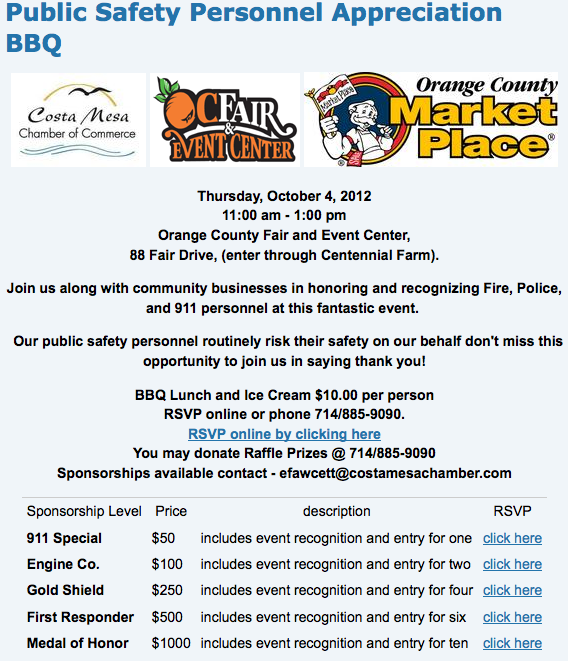 If you attend , take some pictures to display on your blog. this is your best blog article in many months. The Costa Mesa brand is strong, we have a great city. All the bickering comes from 8 malcontents. God Bless Wendy. We have been laying low since she is not up for re election but good to see her town hall meeting. Council has been doing a tremendous job. roadie, thanks, but Bever's "eagle" status has been revoked long ago. His behavior on the council has earned him permanent "turkey" status - irrevocable. "roadie, thanks, but Bever's "eagle" status has been revoked long ago. His behavior on the council has earned him permanent "turkey" status - irrevocable." Agree. Mayor 909, Bever, is a classless, clueless buffoon who helps erode the Costa Mesa and Republican brand. He'd sell out his mother for a $300. re-sale antique. HaHa - Onan - get a grip on yourself! We are all grateful for the 10 or so years of service that Mayor Bever has devoted to our city. I am voting for him to continue his contributions to our city on the Water Board now that he will be termed out for a counsel seat. Maybe he will come back to the council like Gary did and Genis is hoping to do, after his term on the CMWD. His mother is a very nice lady and he would never sell her out. 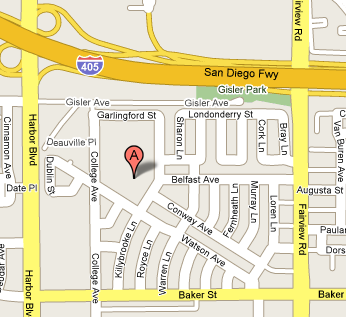 Why do you refer to Mayor Bever as Mayor 909? Isn't that an area code? You should have called him Mayor 714 or Mayor 949 - try to get it right next time. I'm sure you can do it as you seem to be such a nice guy.